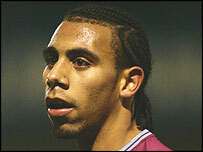 Premiership footballer Anton Ferdinand has been charged with assault and violent disorder. The West Ham defender and England under-21 player was arrested in October following an incident outside the Faces nightclub in Ilford, east London. Mr Ferdinand, 21, of Mottingham, south-east London, will appear before magistrates in Redbridge on Friday. He has been charged with assault occasioning actual bodily harm and violent disorder. Ferdinand, born in Peckham, south London, has made 93 league appearances for West Ham since joining them in December 2002. Edward Dawkins, 28, from east London, was also charged with actual bodily harm and violent disorder in relation to the incident. Mr Dawkins, whose occupation is listed as a director, was bailed to appear at Redbridge Magistrates Court on Friday.